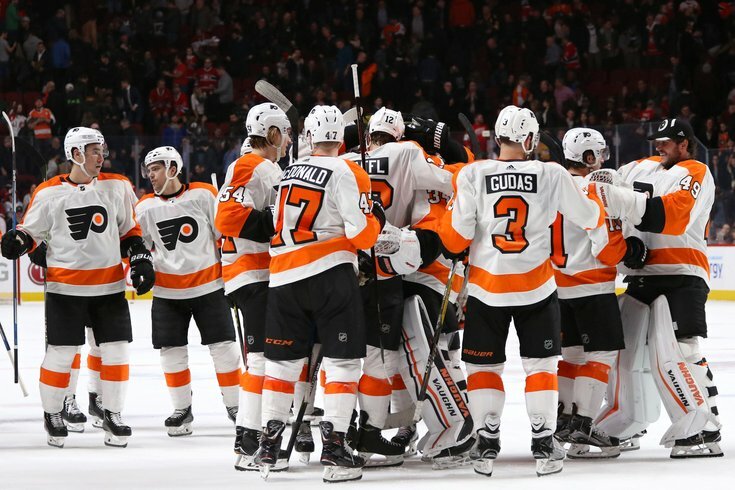 The Philadelphia Flyers celebrate after defeating the Montreal Canadiens at Bell Centre on Monday night. About two weeks ago, the biggest question surrounding the Philadelphia Flyers was whether or not they could even make the playoffs. But now, in the midst of an 11-game point streak (10-0-1), the question surrounding the team has become, "Just how far can these Flyers go in the playoffs?" During the same time in which the National Hockey League might have shut its doors in order to participate in the Winter Olympics, the Flyers have, at least temporarily, launched themselves into first place in the Metropolitan Division. More importantly, they've become a very real worry for any team they might face in the playoffs. And this is no short-term mirage. While the Flyers roared through February, the ride to the top has been a slow and steady escalator that began way back in early December. The Flyers are 26-8-3 since December 2, when the Flyers finally pun an end to that 10-game (5-0-5) winless streak many thought was a sign of things to come. Instead, it was quite the opposite. Mind you, the Flyers have one of the youngest rosters in the NHL. And this turnaround has come with not one, but two goalies recovering from lower body injuries. So, while some teams were beefing up their rosters at the trade deadline by acquiring rental players at huge premiums, Flyers general manager Ron Hextall, made a rather minor tweak by claiming veteran defenseman Johnny Oduya off the waiver list. First, he likes this roster and the chemistry that has developed in the locker room. And second, Hextall is not going to view this run as some sort of short window of success. The Flyers are focused on the big picture, the one that extends far beyond this coming spring, and Hextall was not going to risk that long-range plan for a short-term boost. Hextall already made a pretty sweet move that cost almost nothing when he recently traded for goalie Petr Mrazek from the Detroit Red Wings. Well, all Mrazek has done is win this first three games and earn a remarkable shutout with several 10-bell saves in a 1-0 shootout win Monday night in Montreal. It has been that kind of year. At least since December 2, 2017, when the Flyers' season seemed to do a complete 180. In the three months since, Claude Giroux has established himself as a likely finalist for the Hart Trophy as the NHL's Most Valuable Player; Sean Couturier, who scored the game-winner on Monday night, has maintained his status as a primary candidate for the Selke as the NHL's best defensive forward and could be in line to win the team's MVP award; and Shayne Gostisbehere has emerged as a possible finalist for the Norris Trophy as the league's best defenseman. You can also presume that coach Dave Hakstol will be a finalist for Coach of the Year honors, although that award is a lock to go to Gerard Gallant who has led the expansion Las Vegas Golden Knights to an almost fictional first season. Jake Voracek has continued to pile up assists and key goals. Rookie Nolan Patrick has earned a spot on the second line and, with each passing game, shows signs of developing into the sort of big, physical center with great skills that was that he was touted to be when the Flyers selected him second overall in last summer's NHL Draft. It really is difficult to absorb what this team has accomplished over the past three months, but there is always the warning that an escalator to the top is not as quick as an elevator going the other way. All the Flyers have to do is take a look behind them and see what happened to the Rangers, Islanders, Devils and Hurricanes. Those teams were all in the mix with the Flyers when their seasons went south, to the point where the Rangers held a recent yard sale to start a rebuild. The Flyers have built up a pretty good reserve of points that virtually ensures a playoff spot, but the next five games will be a big test. Perhaps that's why Hakstol has been so unwilling to absorb some the magical happenings of the past few months. It's hard to enjoy the present when you're staring ahead and see five difficult games. It starts Thursday night at home against Carolina. Although the 'Canes are a bit of a mess, they're still a contender for a playoff spot, and the danger for the Flyers is the inexplicable problems NHL teams have when coming back home after a couple of big road victories. After that, there's a weekend trip to the state of Florida for back-to-back matinees against the powerful Tampa Bay Lightning, who went full win-the-Cup-now mode with trade deadline additions of Ryan McDonagh and J.T. Miller from the Rangers, and the Florida Panthers, who have quietly emerged as a playoff contender. Then the Flyers have a back-to-back next week in which they'll face Sidney Crosby and the Pittsburgh Penguins in Philadelphia followed by a trip to Boston to face the Bruins. This will be a very difficult task for a team that has been steadily climbing a mountain for the better part of 100 days. The view might be wonderful for now, but Hakstol knows his team cannot let any sort of stumble turn into a long downhill tumble this late in the season. The Flyers are roaring into March like a pride of lions, and if they keep this up, that roar will only get louder once April – and the Stanley Cup Playoffs – arrive.